Infi-ShieldÂ® Gator Wrap prevents infiltration by providing a water-tight seal around any manhole, catch basin or concrete pipe joint. Gator Wrap resists harsh soil conditions and also provides a root barrier for any crack or joint. 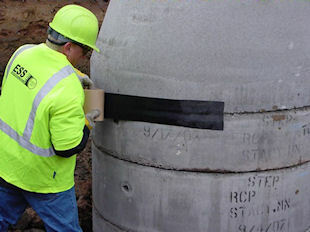 Infi-ShieldÂ® Gator Wrap installs easily with no special tools and can be immediately backfilled.